I can’t even begin to describe how much I love these rainbow bites of goodness! Few things are better on Saturday Smorgasbord night (a little family tradition of ours that involves eating appetizers for dinner at the end of the week!) 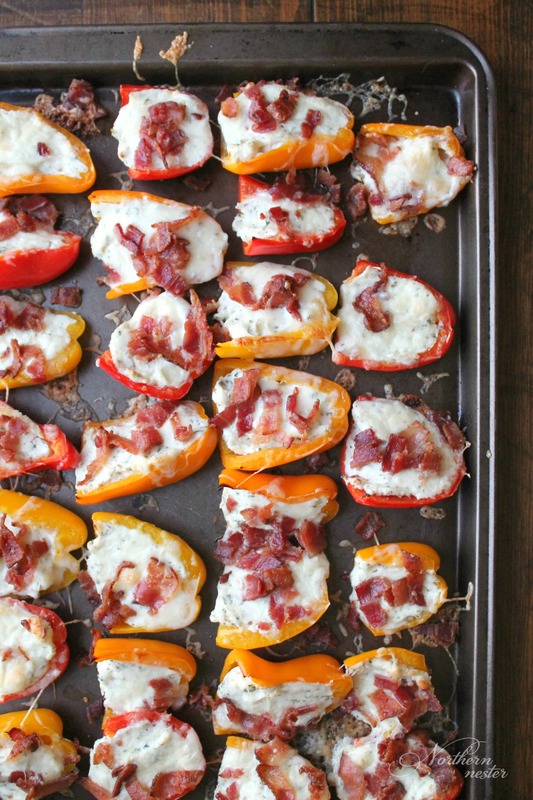 than a sheet pan full of these bacon, herb & garlic stuffed sweet mini peppers. They are loaded with flavor, made without any special ingredients, and are perfect low-carb, Trim Healthy Mama-friendly S appetizers or snacks! For color and convenience, I use a whole bag of mixed, mini sweet peppers in orange, yellow, and red. Flavor-wise, sweet red peppers are my favorite. If you can’t find minis, you can use large red bell peppers and quarter them instead for bigger appies with the same flavor. The cheese-y filling is made by blending a softened block of cream cheese together with freshly minced garlic (or use the stuff in a jar for convenience! ), Parmesan cheese, dried parsley, oregano, and ground pepper together. 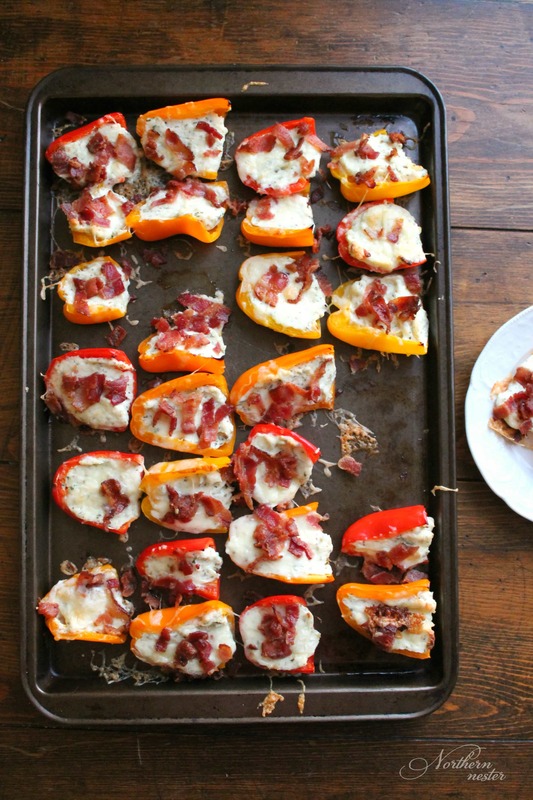 A little crumbled bacon and finely grated mozzarella cheese on top are the crowning glory to these mini sweet peppers. Roasting them in the oven at 420 F for 18-20 minutes and broiling the mozzarella at the end for a minute until it goldens, leaves these bacon, herb & garlic stuffed sweet mini peppers with just enough bite and sturdiness to the pepper without compromising that wonderful roasted flavor. Slice the tops off of each mini sweet pepper and cut the peppers in half. Scrape out the membranes and seeds. Arrange in a single layer on a rimmed baking sheet, face up. Beat cream cheese, Parmesan, garlic, oregano, parsley, together. Spread mixture onto each pepper half. Sprinkle stuffed peppers with finely grated mozzarella. Top with bacon crumbles. Bake @ 420 F for 18-20 minutes. Broil for 1 minute to brown mozzarella slightly. 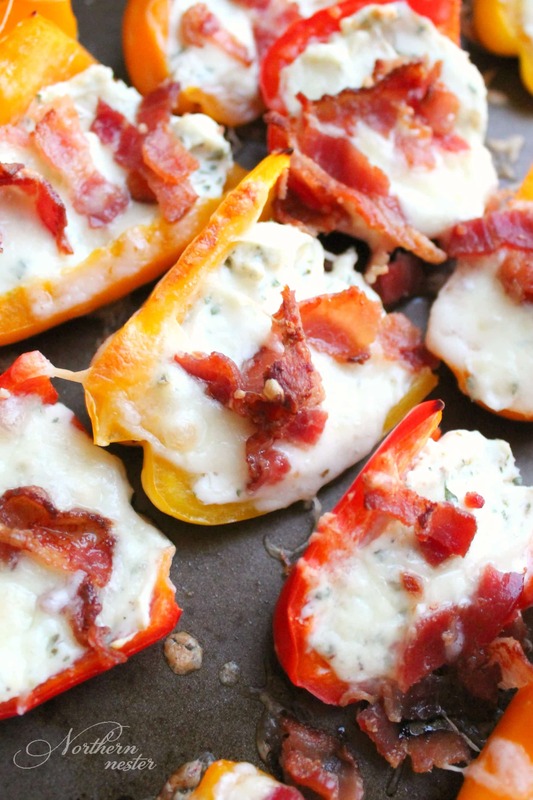 How many regular sized peppers would you use for this recipe? These were perfect, easy, and so delicious! I brought them to a Christmas party and they were a hit, particularly for my Keto friend! I accidentally processed the cheese mixture with the mozzarella, so then I sprinkled a bit more mozzarella on top.